Today: Mashed potatoes are the glue that holds any feast together -- we'd just rather they didn't taste like glue. People have strong opinions about mashed potatoes. Why? Because they can go so terribly wrong -- and become a gummy, mortar-like substance. Jeffrey Steingarten even devotes an entire chapter in The Man Who Ate Everything to mashing the tuber, and Joël Robuchon won a Michelin star for his take on the traditional mash. You should approach potatoes with a clear and deliberate plan, depending on if you desire a fluffier or more rustic end result. After all, you've already got your pie dough down to a science! If smooth potatoes are the goal, then smooth potatoes you shall have. There will be no comments from that picky guest: "What's this? A lump I see in my mash?" Not all potatoes enter into the mashing race on equal footing: Which type should you use? 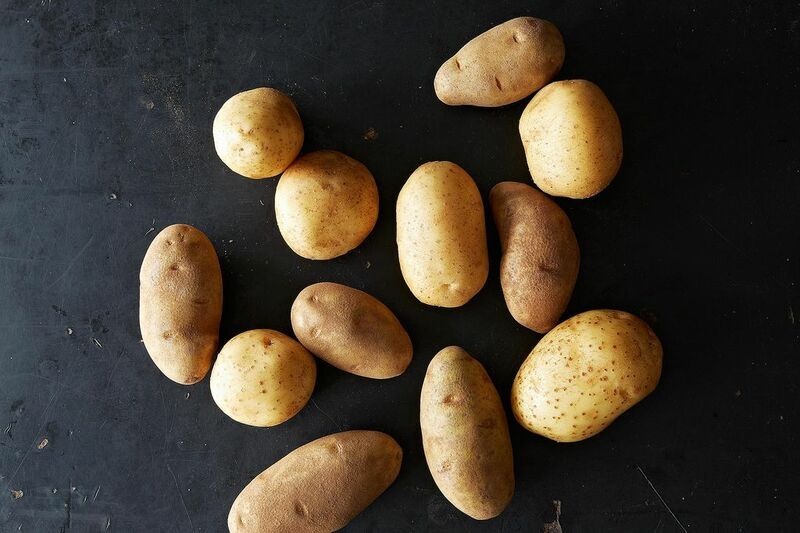 The starch content varies depending on type of potato; we recommend going with Russets. Think all the way back to your high school biology class, specifically the part where you learned about how cells break down. Jog your memory, now apply that information your potatoes -- it's all about the starch vs. water content. We need to strategically combat the potato's starchiness; both overcooking and undercooking will result in gummy potatoes. The least labor-intensive strategy is cooking the potatoes with the skins on, as it prevents absorbtion of water by the starch molecules. (Just make sure to scrub the skins, first.) Instead of boiling, which allows the potatoes to absorb liquid, we steam the potatoes in an inch of water. The time will vary depending on the quantity of potatoes -- somewhere between 20 to 30 minutes. Test for doneness with a knife; it should slice through without difficulty, and the potatoes should remain intact. 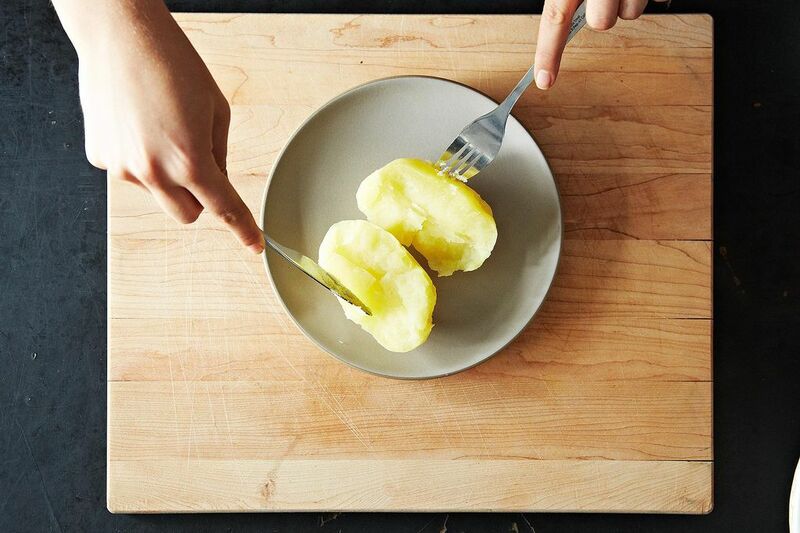 Now, peel the potatoes -- it will be easier than peeling when the potatoes are raw. After peeling, return potatoes to the warm pan and allow the remaining water to evaporate. If you are going to peel the potatoes before cooking, be sure to wash off the extra starch, evident when the stream is clear. Our biggest caveat after thorough research is to keep all electronic appliances away from your mashed potatoes. Old school is the way to go. Cook's Illustrated recommends using a ricer or a food mill in order to reach the top level of lightness. When using a ricer, simply push the potatoes through the ricer in small pieces and stir in your added ingredients. After using the ricer or food mill, keep the potatoes warm! Use warmed milk, cream, or half and half and tabs of butter. Add the milk slowly, and be careful not to overdo it. Now is the time to salt; you'd be surpised how much salt you can add before you start to taste it. A handheld potato masher is the tool of choice for this; a masher that breaks the potatoes up into smaller chunks will work better than a traditional wire masher. 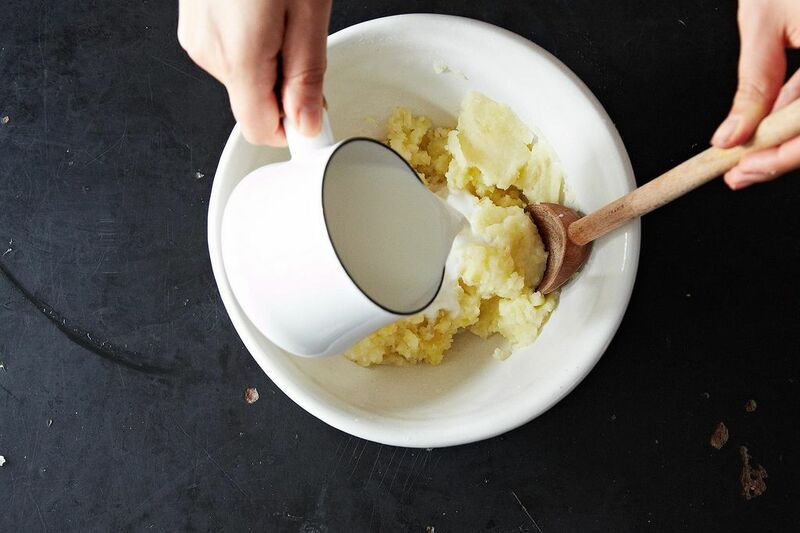 Keep potatoes warm, add your warmed milk, chilled butter and salt, and get to mashing. Do not overdo it -- or you will enter the glue stage. A crock pot can serve as an excellent warming vehicle before your dinner. For reheating the next day, simply throw into a casserole dish, cover with foil, and reheat in a low oven until warm. And of course, pour on gravy liberally. I haven't made mashed potatoes yet--it'll be later this weekend that we make grandma's recipe. But I never added dairy of any sort to mashed potatoes. Grandma boiled potatoes and a large onion in a pot of salted water. Drain, reserving some of the water. Then mash, onion and all, with a hand masher. Very succinct article. It sparked great comments. And with your replies it became a knowledgeable forum. Instead of just a list of ingredients and procedures there was the science and logic that sealed the deal. We aren't being merchandised. We're sharing. That's called a holiday. Thanks to all. Very important tip... be sure to add your butter first before adding the milk or cream. Little bit of science here, as the fat added before any liquid prevents the potato from becoming "pasty" or gummy. Once the potatoes are done with the boiling, drain water and put back the pot back on stove to "dry" any remaining moisture. Then add the fat, followed by the dairy liquid of choice. Thx for your comments. Got a lot of great tips. HAPPY THANKSGIVING TO ALL! I read this hoping to get some new info, but I have to politely disagree with a couple of things. First, since when do reheated potatoes taste as good? I have eaten my share of leftover potatoes (even cold for breakfast) and they are good, sure, but not the same as fresh. They can be kept for several hours in a crockpot or in whatever big bowl you're going to serve them in, placed over a big pot of simmering water. Second, yes, ricing and steaming is great, but I have 14 people coming for Thanksgiving and will be doing ten pounds of potatoes - I have never seen a ricer big enough to handle that quantity in a reasonable amount of time (or without the potatoes getting cold - and me getting very testy. 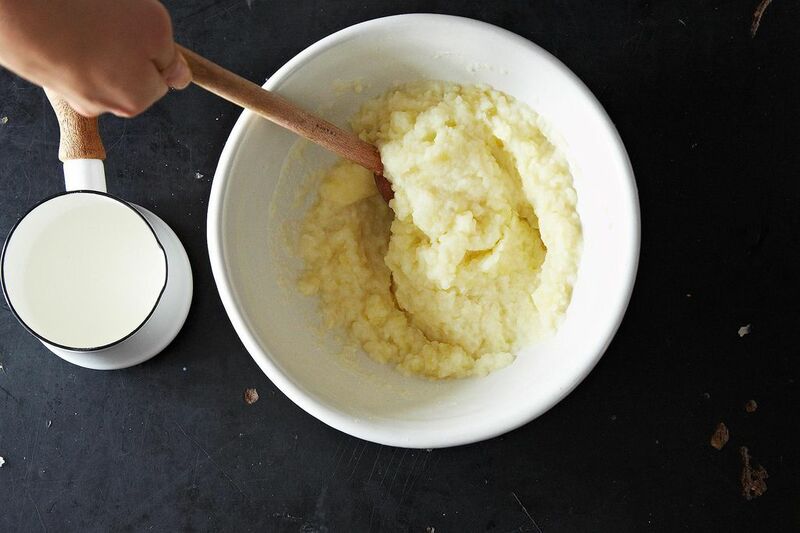 Finally, I find that as long as you mash them (and I do use an electric mixer) first before you add milk or cream, you can ensure there will be no lumps. Once you add milk, lumps are permanent. I do add butter and salt first. Lots! Thank you for weighing in, Carol. That sounds like a solid plan for dealing with extra large batches of potatoes. I always seem to have questions. I like the idea of steaming. But if you are doing say 7 pounds of potatoes, do you have any tips on how to do this? Help please. That's a whole lot of potatoes. I would suggest steaming them in batches! That's what I thought. Thanks. Much appreciated. @tastysweet in my house we regularly mash 10lbs of potatoes and effectively steam them by making the first layer of potatoes the support and keep the rest of the potatoes out of the water and steamed. Can I reheat them the next day with the crock pot? I am going to my sisters. Would like to make them the day before. Yes! See Diane Terry's comment below. Crock pot is a great idea. So if you make them the day before and have to bring them somewhere, how long to reheat? Hours? Thx Emcsull, what's the downside? No major downside. You just have to be careful that they don't dry out too much. I would add a few drops of water and cover them while nuking. You might need to add additional milk as well. Can you reheat mashed potatoes in the microwave? Great tips! I'm going to do the crock pot warm thing this year, thanks Diane! Loved your idea to steam the potatoes, rather than boiling them, but after all that, why pour 'gravy' on the potatoes? Won't the gravy be happier on the meat instead? Ha, yes. That's just what I do when I eat mashed potatoes on Thanksgiving. I always put a big spoonful of gravy on top. I mash my potatoes first, then take my $9 el cheapo crockpot used only for such occassions, line it with a healthy dollop of butter, throw in the mashed potatoes, finish with another dollop and voila, one last thing to worry about at the last minute. Keeps them perfect. 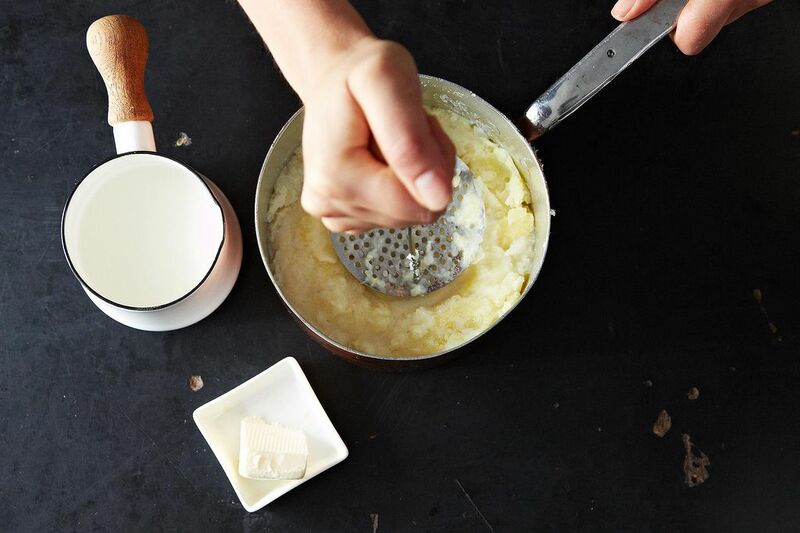 Try mashing your potatoes with buttermilk instead of cream. A tasty swap made out of desperation when I ran out of cream. I came across a great suggestion for reheating mash- using a double boiler! I was shocked at how well it worked. Usually I go straight to the masher, but you have inspired me to use my ricer for my Thanksgiving mash. One thing, I usually melt my butter along with the milk/cream. Any reason not to? Glad to hear it! 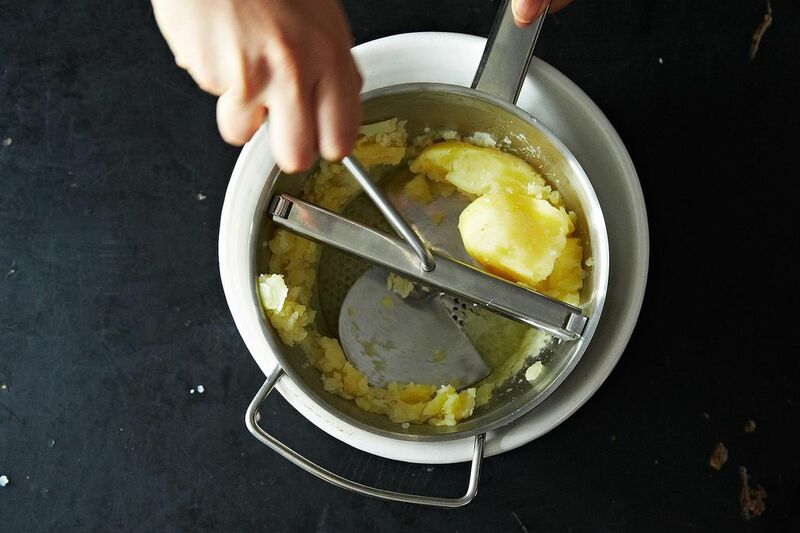 Adding cold butter allows the fat of the butter to distribute evenly in the potatoes.